The Microburst 3000 aerosol dispensing system delivers power, performance and flexibility in half the size of standard aerosol dispensers. 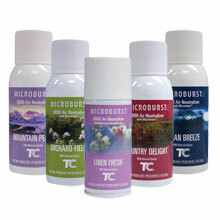 The Microburst aerosol refills deliver three times the odor control and fragrance as ordinary refills and contain 63 percent less VOCs per spray than a standard aerosol. The patented refill actuator distributes the finest dry mist for long lasting performance. 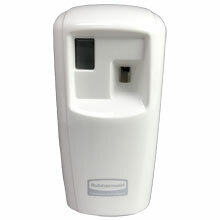 The Microburst 3000 system combines great looks with a low-cost and effective performance.